We pulled together the most popular standing desk mats on the market, spoke to ergonomics experts about what to look for to find the best among them, then spent a week standing on them while we worked. We discovered that the best mat is largely a matter of personal preference. 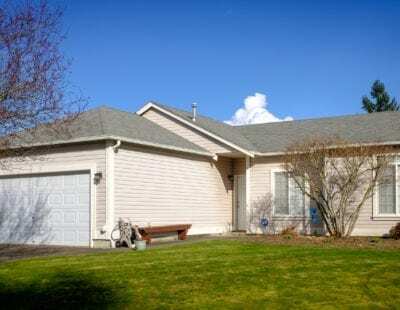 Our favorites struck a balance between soft and supportive materials, had interesting enough terrain that we didn't mind being on our feet, and encouraged a healthy rotation of sitting and standing. As standing desks became increasingly common, antifatigue mats were designed to alleviate some of the discomfort associated with long periods of standing. 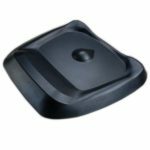 But standing desk mats have undergone considerable evolution: In addition to flat mats made of polyurethane, you can also find mats with various hills and inclines, and others that wobble and pivot under your feet. The best mat for you depends on how much experience you have standing and how much you want to move. We sought out the most popular, best-selling standing floor mats, the ones people snap up on Amazon and sing the praises of on workplace ergonomics blogs. These included flat mats from seasoned competitors as well as unique mats from manufacturers that were disrupting the space and trying something new. All of the experts and research studies we consulted agreed: In an ideal world, no one would spend more than 45 minutes to an hour being completely stationary during the day, either sitting or standing. So we had 10 testers (of different body types and with varying standing preferences) stand on them in one-hour increments. In flat mats, we looked for a balance between firmly supportive and comfortably soft. For active mats, we wanted an engaging design that invited testers to explore the features. Preference was given to comfortable mats that encouraged testers to periodically stand at their desks. Out testers hard at work. We also paid close to attention to how easy it would be to integrate these mats into our daily routines. Some were much easier to slide under our desks when we transitioned and some were even easy to roll our chairs over. The Topo by Ergodriven is great for active standers who prefer more cushioning and would enjoy the natural subtly of it’s 3D elements. Particularly in its flat space, the Topo is perfectly soft. We asked our testers to rate their mats firmness on a scale of 1-5 (1 being too soft, 3 being a balance of firm and soft, and 5 being too firm). The Topo was the only mat to frequently earn a score of 3. The TerraMat, by comparison, received 4s and 5s. If you like padded insoles in your shoes or a memory foam mat at the kitchen sink, you’ll love the Topo. The Topo is based on the idea that humans aren’t made to stand on flat ground. The designers even made a video demonstrating the natural, healthy habits of humans to show how they translated those ideas to their mat. The mat is meant to mimic ridges and terrain of natural ground. The Topo features a ramp at the back of the mat and raised edges around the sides. The combination of details allowed for lots of calf stretching and simple foot engagement. 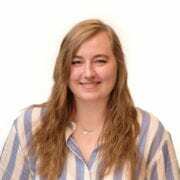 One of our testers who typically sits throughout the day loved the comfort and support of the Topo, comparing the molded surface to the inner soles of her Birkenstocks. “The mat relieved the tension in my standing foot/hip and even let me relax my lower back.” Gentle slopes and cushioned support make the Topo great for subtle foot adjustments while you stand. Taller testers found the Topo’s smaller base a bit restricting — they were spending a lot of time resting their feet off the mat. Also, the tear-drop mound right in the center of the mat was a source of disagreement: For some testers, it was a fun feature for their feet to explore; for others, it crowded their standing space. If you have large feet or a naturally wide stance, the Topo may not be right for you. The Terra Mat Standing Desk Mat, like the Topo, encourages subtle movement and stretching. But the Terra mat features plenty of flat space, making it popular with our taller testers who enjoyed stretching their legs and interacting with the pronounced peaks and bars. If you like exploring with your feet or if you have a naturally wide stance, the Terra Mat, with its pronounced but widely spaced mounds and distant beveled edges, is designed for you. If you’re looking for a physically engaging experience that will keep your feet constantly moving over the whole width of a mat, this is for you. The TerraMat is a topographical mat that has five different features to engage with. From “massage mounds” to a balance bar, there are plenty of ways to utilize the mat’s terrain. The testers who preferred the TerraMat found themselves shifting position frequently, but not for a lack of comfort — the scattered features simply encouraged more movement. Overall it received positive responses for its raised slope (great for stretching out the ankles) and beveled bar (to massage the foot). There’s quite a bit of flat, firm mat space on the TerraMat. Some of our testers like that extra room, but others thought the wider range hindered them from using the active features on the edges of the mat. If you’re more interested in a comfortable, static stand, or nearby interactive elements, check out the iMovR or the Topo. All of our testers agreed, this board is fun — a slick skateboard without wheels. 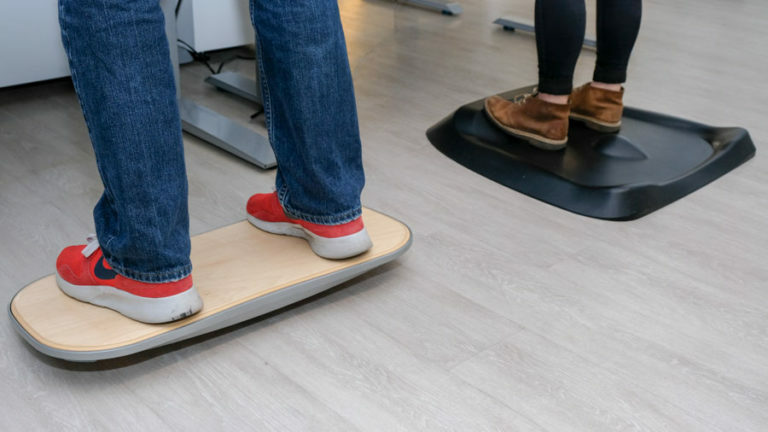 If you’re looking for an engaging mat that will encourage you to spend more time on your feet, the Fluidstance Level is sure to get you excited about raising that standing desk. The Level encourages constant movement. In fact, it’s pretty difficult to stop moving on the Level: Its unbalanced frame involves a lot of circular motion and rotation of the knees. 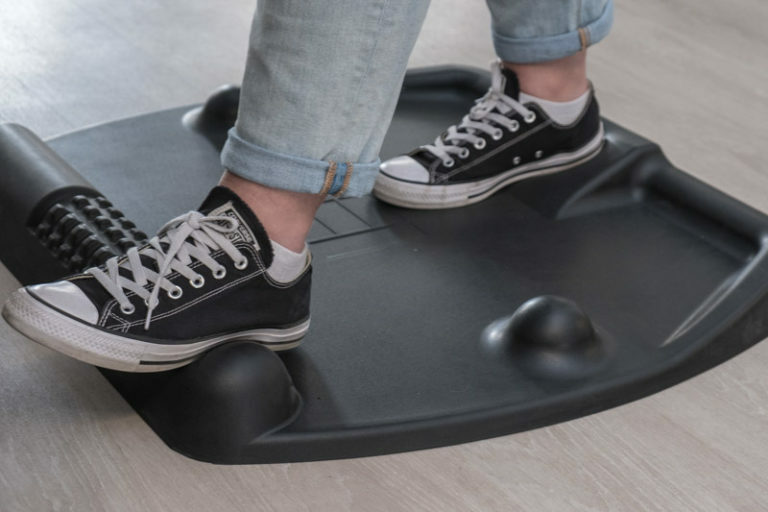 One tester said, “I would be encouraged to stand more often on it, mainly because it’s such a fun contraption.” This board is great for fidgeting, engaging the core, and pulling you out of an afternoon slump. The Level by Fluidstance balances a sleek look with innovative movements. With its finished wood surface and die-cast aluminum construction, the Level was the best-looking mat we tested. The elegant design made the Level the only mat praised for its visual appeal — a real standout amidst a sea of dark black mats. If you’re looking for a softer mat or plan on standing for long periods, the Level’s wooden surface probably isn’t for you. 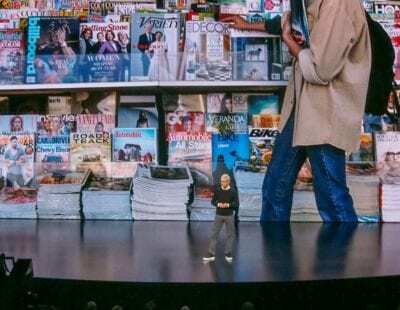 For one, the design is a bit limiting because you can’t really adjust your feet while standing on it. 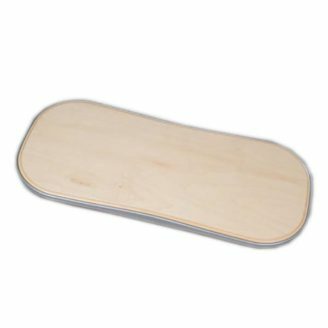 A tester who otherwise enjoyed the ride told us, “This board would be great for someone looking to improve their balance, but I like to shift my weight from one foot to the other when I stand, and it’s really hard to do that with the FluidStance.” If you want the constant movement, but are interested in more cushioning, the Plane from Fluidstance (made of 100% recycled low-emitting rubber) could offer more comfort. 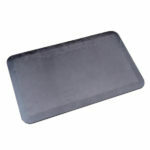 The iMovR EcoLast Dual Gripper Standing Mat is the best flat mat we experienced. This unobtrusive mat provides springy support without being too soft, and feels truly energetic compared to standing on the bare floor. It feels a lot like the bouncy rubber mulch of a playground. 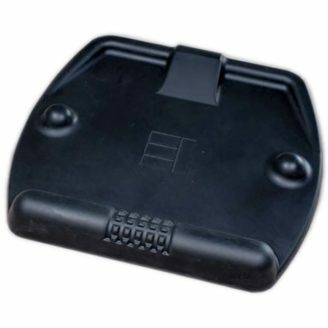 Looking for simple standing comfort, one that works for all kinds of shoes and environments? The EcoLast’s sleek black appearance is inconspicuous enough to be used in professional environments — unlike flashier competitors, it blends easily into any workspace. It’s also durable enough to hold up against heels. 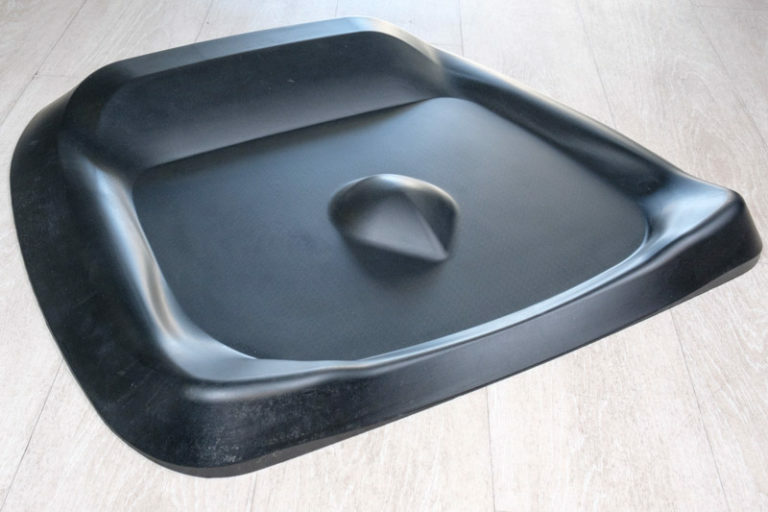 The bottom of the iMovR EcoLast Dual Gripper Standing Mat comes with rubber grips that keep it in place on hard flooring, as well as Velcro patches that keep it from sliding on carpet. We wanted to love the more affordable flat mats we tested, like the Imprint CumulusPRO or the Sky Mat Standing Anti-Fatigue Mat, but our testers said the less expensive mats were too “squishy” to provide adequate support. 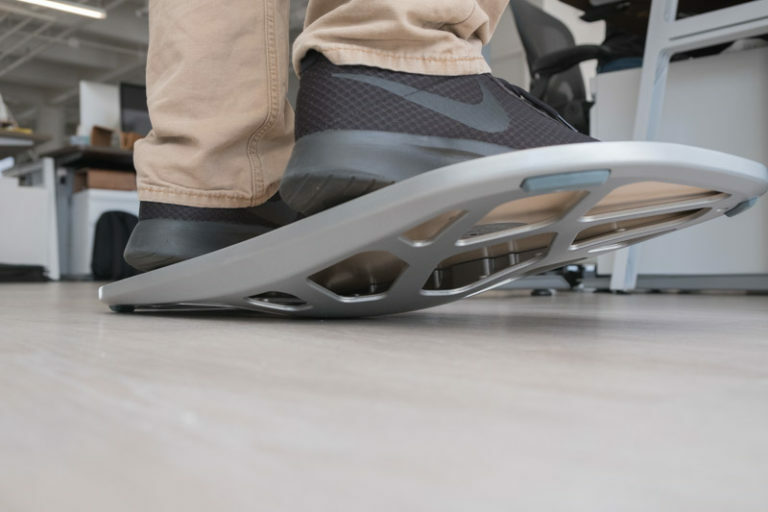 If you want a large, well-built, high-grade sheet of polyurethane that’s actually going to reduce your fatigue while standing at your desk, it’s going to cost you more than $100. Are you new, or accustomed to, standing work? Our testing surfaced only a few points of consensus on the elements of the best standing mat. Meaning that “best” really boils down to personal preference. One trend did bubble up, though: If you’re just starting to experiment with standing desks, an active mat can help. 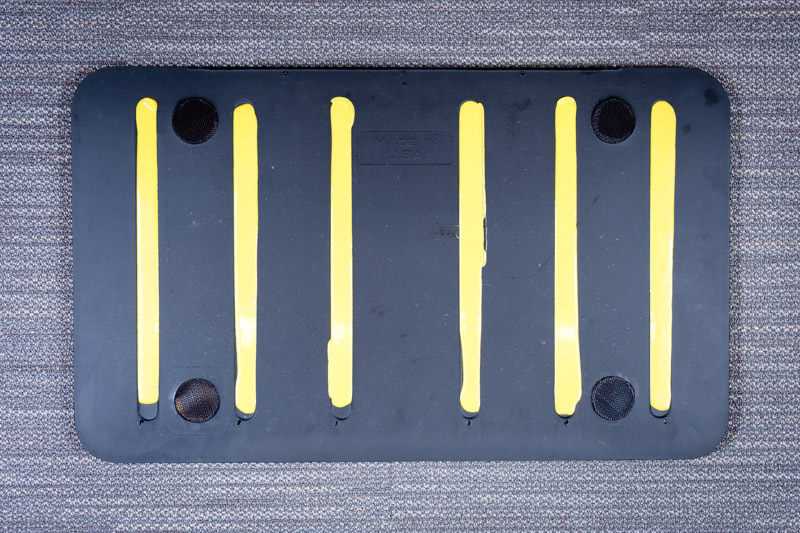 Testers who regularly sat during the workday found these mats appealing because they encouraged movement and gave them more incentive to stand — the benefit of the flat mats wasn’t as apparent to them. Seasoned standers, on the other hand, enjoyed the flat mats as much as the topographical mats because both were more comfortable and supportive than standing on the bare floor. The majority of standing desk mats on the market are flat. They’re similar to kitchen and garage mats in design, and they’re the preferred choice for workers who have to stand all day long. A good flat mat offers a bit of supportive cushioning for your feet, and our testers all agreed flat mats were better than the bare floor. While less exciting than the active mats, flat mats are the standard solution to standing fatigue, and must-have if your work environment is standing-only. They’re also ideal for areas with high foot traffic, where raised mats could be a tripping hazard. Topographical active mats are designed with raised ridges and engaging features so your feet make frequent and varied movements. The purpose of the designs aren’t obvious to the eye. But after a few minutes on them, intuition (and mindless curiosity) takes over as you shift your feet and rest in different poses. The wobbly type have the same goal — constant movement — but take a more radical approach. Should you only look at 100% polyurethane mats? Many standing desk mat reviews (including an older version of our own) cut from the running mats that aren’t made of polyurethane. This decision is based on a 2015 research study from Texas A&M University that anti-fatigue standing desk mats made from 100 percent solid-form polyurethane helped to decrease spinal compression by as much as 40 percent. While the results are sound, they’re not exactly pertinent to standing desk mats. The study had testers from an industrial furniture manufacturer and industrial pipe/valve reconditioner/manufacturer, stand all day everyday on the mats. In reality, the polyurethane standard is only a crucial consideration if you have to be standing all day long. And our experts agreed: If you don’t have to stand all day, you shouldn’t. The study showed some improvement in spine curvature/spinal compression, but those issues aren’t concerns if you’re alternating between standing and sitting positions. Should you stand all day? No. Using a standing desk and an anti-fatigue standing desk mat are great ways to avoid long, sedentary hours in a chair, but they can also lead to their own problems. As Dr. Neal Wiggermann, an ergonomics specialist, told us, “Just as sitting all day appears not to be good for you, standing all day is also unhealthy. It can increase the risk of plantar fasciitis, hip or knee problems, varicose veins, and cause fatigue. I’d rather have an employee sit all day than stand. But being able to intermittently transition between the sitting and standing posture does appear to be ideal.” All of the experts we talked to agreed — it’s best to do some sitting and some standing. What is the ideal standing posture? Even after you’ve converted to a sit/stand rotation, there are still a few ways to optimize your experience and prevent body fatigue. Your standing desk should be raised to the height of your elbows, at a 90-degree angle. This practice will prevent straining your joints and allow for longevity when typing. Your neck is also at risk when shifting to a standing position. Your screen should have a small upwards tilt so that your neck is never shifted too far up or down while working. And while we’re at it, try keeping your screen about 20-28 inches away from your face. That’s basically the distance between your elbow and the tip of your middle finger. This position might feel a little robotic at first, and it’ll likely be difficult to maintain, but the long term effects on your body are worth it. 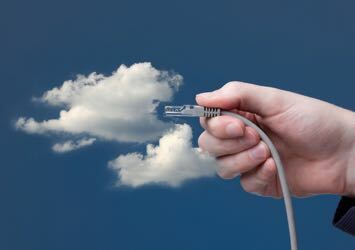 Whether you’re outfitting your work office or home office, having the right equipment for a comfortable, focused day promises to increase your productivity. We experienced the boost ourselves as we personally tested the best-in-class products in the reviews below.